I am a big believer in saying thank you to your debt because you gain something from that. So let's say you had student loan debt. I'm thankful for my student loan debt because it got me my career and my law degree. 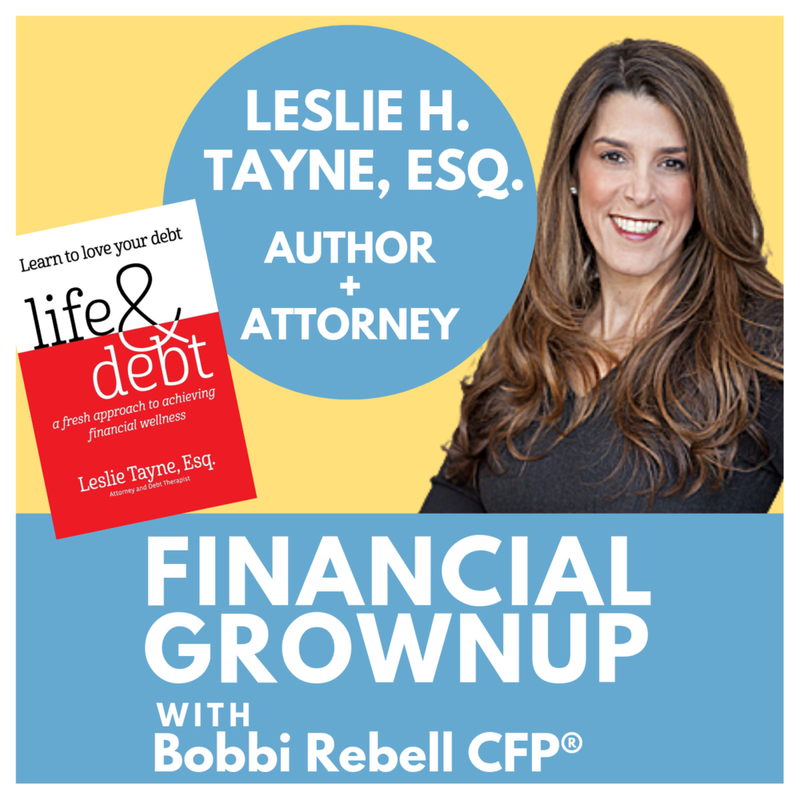 You're listening to Financial Grownup with me, Certified Financial Planner, Bobbi Rebell. Author of How to be a Financial Grownup. And you know what? Being a grownup is really hard, especially when it comes to money. But it's okay. We're gonna get there together. I'm gonna bring you one money story from a financial grownup, one lesson, and then my take on how you can make it your own. We got this. Hey, Financial Grownup friends. So the clip that you heard at the top was a big moment for me. I had never really thought of debt as something that was actually a symbol of things that that debt had allowed you to achieve. To help you get to your goals. And we don't always think of debt that way. It's a mindset and we're gonna come back to that. First, welcome to everyone. Especially to our new listeners. Let me tell you a little bit about the show. We interview high achievers that share personal stories about money that had an impact on their lives. We also give you every day money tips that you can put to work right away. In this case, as I mentioned, we're gonna be learning how to change our debt mindset. Now, the fantastic guest for this episode is Leslie Tayne. She is the author of Life and Debt. Also an attorney. And before we get to that every day money tip, she gets very real in her money story about a broken engagement. And you're also gonna hear some information about my own break up that was a little bit scary for me to talk about. My own broken marriage. We actually went through with the engagement. Did get married. And things did not work out. And a lot had to do with our different money mindsets. Here we go. With Leslie Tayne. Hey, Leslie Tayne. You're on Financial Grownup. Welcome to the Podcast. I have you on for a number of reasons. One of which is you know a lot about a lot of financial things. You are the author of Life and Debt. A fresh approach to achieving financial wellness. Congratulations on the book. I don't think, from my perspective, that it's realistic to really be out of debt. I think that it's a different mindset when it comes to debt resolution, which is learning to love your debt and accept it. So I took this totally different approach about debt management, debt resolution. Whatever concept you want to call it. But I took a totally different approach which is to learn to love your debt, accept it, know that it's part of your life, and find really good strategic ways to manage it so it works for you. Love that. Because it's not always realistic to just say I'm not gonna have it. We have to live in the real world. And part of living in the real world is being realistic about relationships, which is hard to do when we're caught up in things like engagements and all that goes with it. And I know I had a short marriage in my 20s, which broke up for a number of reasons. But money, as is the case in many marriages, our different money values was a factor. And that was also a factor in a big decision that you made. Yes, it was. I actually was also engaged to somebody. And I ended the engagement due to what I'm gonna call bird and fish issues related to finances. Alright. That's a good tease. What does that mean? So bird and fish issues have to do with my conceptualization of the differences between people's ideas of money. For example, if you're a spender and your significant other is a saver and you really like to spend and don't think about it and your significant other is a saver, you have bird and fish issues. So obviously a bird can't live in the water and a fish doesn't live in a tree. So when you have significant bird and fish issues from a financial perspective, your relationship, unless you can really manage it, is not likely to succeed in that particular area. So with my significant other at the time, my fiancé, we just did not see ... And he was a great guy. It wasn't the person. It really had to do with the fact that from a financial perspective, he saw things very differently than I did. And it wasn't something that I felt would make a successful long-term relationship. So what were the red flags? Did you ask his credit score? I told him that I thought it was in his best interest to pull his credit and take a look at it and make sure that there was nothing on there that he wasn't aware of. Did you find out what the number was? What's an example of that? Spending without thinking. Like having 100 pairs of jeans. Just continuing to buy without thinking. And then saying, "Oh, I have to pay off my ..." Things that ... These are red flags to me. Excessive spending. Not budgeting. Not being sure how you're gonna make it through the year if you're on salary plus commission. Those are red flags and problems to me. That's a money management issue. It became problematic when I would hear things like, "I don't think I can afford that." Well, you should know what you should be able to afford or not be able to afford. Or, "How could I just say no to my kids?" So what were examples of that happening? Vacations. So if I wanted to go on vacation and say I have a different budget than he has or at least I'm aware of my budget than he had. I want to go on vacation and this is what I would like to stay. Then I don't know if I can do that. And I would say, "Well, why would you have a problem doing it based on the things that you told me?" In other words, based on his income, he should be able to afford it, but where was the money going I guess is what you were wondering. Correct. Correct. And it wasn't my place. I didn't feel comfortable that it was my place to micromanage it. Again, I don't want to be in a position in relationships and I don't recommend being in a position where you are micromanaging somebody else's inability to manage their own money. Going into a relationship as adults, each one of you should be managing your money effectively and being aware of your finances, being aware of your debt, having some sort of plan. It doesn't have to be a written dissertation of exactly how to pay it off. But an idea, not when I get some money I'm gonna do this. Or I'll have some money soon. There was a dishonesty piece about not telling me what was going on with the finances and with his finances. There came a point when we were engaged when I said, "I'm not just a girlfriend now. We're engaged and we're talking about a long-term future. So I feel like I have a right to understand or have a good understanding of what your finances are." And when there was a hesitation about giving me that information, I knew at that point that I would not be able to proceed. What is your advice to our listeners? Leslie, tell us your every day money tip. It has to do with debt, but appreciation. And not appreciation in the idea of interest appreciating. A better kind of appreciation. I am a big believer in saying thank you to your debt because you gain something from that. So let's say you had student loan debt. I'm thankful for my student loan debt because it got me my career and my law degree. So I know that sounds like a challenging statement to make. But once you change your attitude and you become thankful for the debts that you have, you'd be surprised how that impacts the totality of resolving your own finances. Because many times, they did help you achieve something. Whether it's having a home, having a law degree, whatever it may be. Yes. You're correct. All of the debt that you have helps you achieve something. You have a car, it takes you places. You have a home, you have a roof over your head. You have food that you bought maybe on credit. You have student loans from an education that you got. It's not that you didn't get something for nothing. You exchanged the debt for something that may not be tangible. But it's something that is useful in your life. Absolutely. So, Leslie, tell us a little bit more before we wrap up about your practice because it is concentrated on debt. And where people can find you and learn more about you. Sure. So I'm an attorney licensed to practice law in the state of New York. And I have a practice called [inaudible 00:09:45] Law Group. We have four offices in New York. But we do help clients outside of New York as well. And we're gonna be opening offices soon in South Florida. Thank you. I have a book called Life and Debt. And all of that can be found online. So you can Google me at Leslie Tayne. T-A-Y-N-E. You can find me on Facebook, Twitter, Linkedin, all under that. Or LifeandDebtBook.com. TayneLaw.com. T-A-Y-N-E-L-A-W.com. And certainly, again, you can always Google my name, Leslie Tayne, and you'll find me all over. Thank you so much, Leslie for sharing such a candid and brave, frankly, brave story. We appreciate it. Hey, friends. Before we get to my take on what Leslie had to say, I just want everyone to know Leslie is happily remarried, as am I. And in both cases, our husbands are on board when it comes to our money mindsets. Financial Grownup tip number one. This one's a little bit hard though, actually. You have to ask really uncomfortable questions if you are going to get serious with someone. I got engaged to my ex-husband. The one that I talked about at the beginning of the interview with Leslie. I didn't know his income. I didn't feel comfortable asking. Seriously. For real. But yet, I was willing to be financial partners with him. Without having that information. That is a don't. We'll leave it at that. Financial Grownup tip number two. Secrets versus baggage. They are very different. Here's the deal, guys. Leslie's problem with her ex-fiancé was not only that they had different money values because they definitely did. It was the secrets though. It was the lack of honesty. Withholding information. That is not the same as having baggage. AKA having lived a life. Things happen. You might have a student loan or even credit card debt. We're all human. Life is messy. Good luck finding someone who is perfect financially. Pretty much any money problem though can be solved if you work together and are honest with each other. Emphasis on honest. So don't confuse life's normal messiness with the stuff that matters. And that is communication and working through financial situations together. No one's perfect. On that note, so grateful to Leslie Tayne. She got candid, and real, and raw. And we're so much better for it. So thank you for helping us all get one step closer to being financial grownups.